LOS ANGELES, Aug. 1 (Xinhua) -- "If we buy a Trump's favorite 'Make America Great Again' (MAGA) baseball cap, it's going to be from China. But thanks to the tariffs, the cost of buying the caps may rise dramatically in the future," Steve Zheng, a California retailer, told Xinhua on Tuesday. 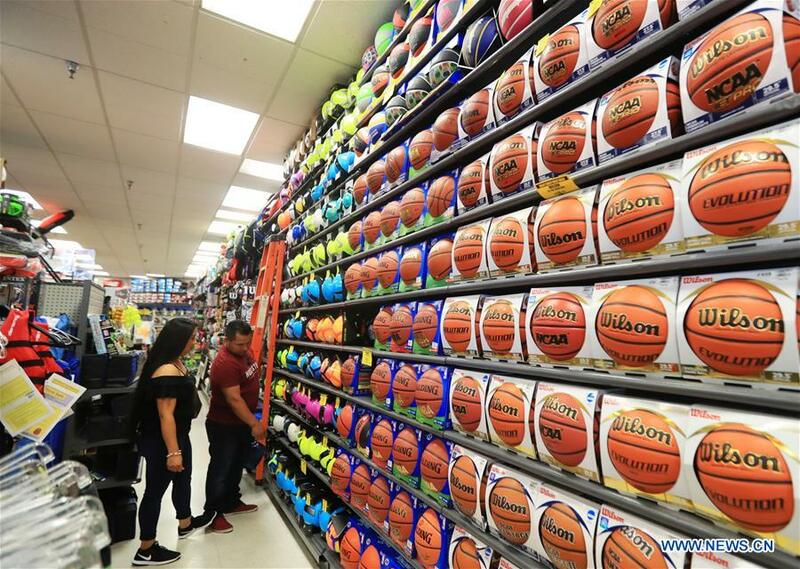 The MAGA-embroidered baseball caps are not the only sports products that may be targeted by the latest round of tariffs on Chinese goods proposed by the Trump administration. Hockey, headwear and sports bags are all targeted for tariffs, according to the U.S. Sports and Fitness Industry Association (SFIA). "Tariff increases back and forth between the United States and China are not good for American consumers," SFIA CEO and President Tom Cove told Xinhua in a recent interview. Trade tensions will hurt American consumers, businesses and workers, he warned. On July 11, the office of the U.S. Trade Representative released a list of proposed targets for 10 percent tariffs on 200 billion U.S. dollars worth of Chinese imports. The new round of proposed tariffs may target sporting products such as backpacks, sports bags, bicycles, hats, gloves and some leather goods. "I don't have a specific number. But it's a significant dollar amount and it's a significant volume of goods from China," Cove said. "The variety products that come from China including footwear, apparel, sports equipment, accessories ... (are) a large number." "If this retaliation tariff goes back and forth even more, it could really be much much bigger," he added. SFIA said it does not support this approach to trade and is urging the president to use alternative negotiating tactics. "We believe that there are better ways to address the problems ... Going back to the negotiating table is the best way," Cove said. "If this continues, I fully expect the industry to be hit harder," Bill Sells, senior vice president of government and public affairs at SFIA, said during a recent webinar. "As they dig deeper into China's exports to the U.S., there's little doubt in my mind that we will be targeted more in the future." Tariffs may also hit the U.S. outdoor industry, an 887-billion-dollar economic force. It supports 7.6 million direct jobs and generates 65.3 billion dollars in federal tax revenue, according to the Outdoor Industry Association's 2017 annual report. "Additional tariffs on outdoor products that are already overtaxed could have a devastating impact on outdoor companies and significantly raise costs for consumers," the association said in a recent statement. The Trump administration's latest move has also drawn opposition from other business groups and some lawmakers, who are concerned the tariffs could be a blow to U.S. consumers and damage the economy. "It's time to stop using the American consumer as a pawn in this conflict. Tariffs are taxes. Period," Rick Helfenbein, president and CEO of the American Apparel & Footwear Association, tweeted. Helfenbein said with more than 84 percent of U.S. travel goods coming from China, the tariffs will impact consumers "enormously." "By including items such as handbags, hats and textiles on this additional list of products, the administration has shown that it is not concerned about targeting the American public with its 'Trump Tax.' This will result in inflationary costs throughout the supply chain, ultimately paid for by American consumers," Helfenbein said in another statement. A public comment period on the list of products is open through August 17, with a public hearing to take place in Washington from Aug 20 to 23. The final list of products subject to the 10-percent tariff will be released after Aug 30. SFIA is urging its member companies to participate in a petition asking to exempt their industry products from the proposed tariffs. Under the "America First" protectionist policies, the Trump administration has slapped high tariffs on imported steel and aluminum, as well as 25 percent tariffs on 34 billion dollars of Chinese products, escalating trade tensions with its major trading partners. A short-term impact will cause substantial destruction for specific categories, Cove said. "And the longer ... the tariffs are in place, the more long-term impact they have."